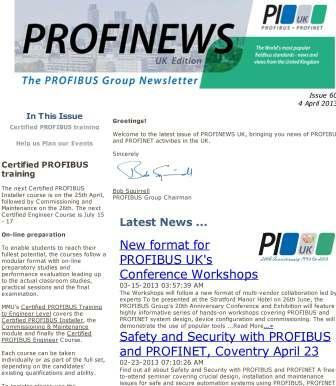 Get the latest news about the UK’s PROFIBUS and PROFINET activities and opportunities. If you’d like to be kept up to date with news of PROFIBUS fieldbus and PROFINET industrial Ethernet communication technology developments, free seminars and other training opportunities in the UK then all you need to do is click here to join our mailing list. It’s easy to join and easy to leave. We’ll only send you real news and we won’t pester you with sales calls – just let you know when something interesting is happening.